Japanese prints have been integral to the identity of the Portland Art Museum since 1932 when the Museum was given more than 750 traditional woodblock prints from the collection of Mary Andrews Ladd. Since then, the Museum’s collection has grown to more than 2,500 works and spans from the late 17th century to the present day. After three years of intensive research, the Museum presents the first major exhibition to draw exclusively from this remarkable public resource. The Artist’s Touch, The Craftsman’s Hand features a finely honed selection of some 250 of the most historically important and visually compelling Japanese prints in the collection. Visitors will encounter familiar artists such as Harunobu and Hokusai—icons in the history of Japanese printmaking—and the prints will be a revelation, as nearly half of the works in the exhibition are unique or extremely rare. Special strengths in the collection include 18th-century actor prints; surimono, deluxe prints that were privately commissioned; and painterly landscapes of the early 20th century, including a series that documents the Great Kanto Earthquake of 1923. The exhibition concludes with the new developments of the Post-War period, from Op Art and Abstract Expressionism to lyrical evocations of an imagined past. The exhibition is accompanied by a fully illustrated catalogue, published by the Portland Art Museum and edited by Maribeth Graybill, Ph.D., The Arlene and Harold Schnitzer Curator of Asian Art, featuring scholarly essays and a complete catalogue of the prints. Partial support has been provided by the Asian Art Council of the Portland Art Museum, E. Rhodes and Leona B. Carpenter Foundation, Japan Foundation, Mary Hoyt Stevenson Foundation, National Endowment for the Arts, Blakemore Foundation, Louis and Virginia Clemente Foundation, Jackson Foundation, Metropolitan Center for Far Eastern Art Studies, Travers Hill Polak, Walter C. Hill and Family Foundation, The Acorn Fund of OCF, Delta Air Lines. 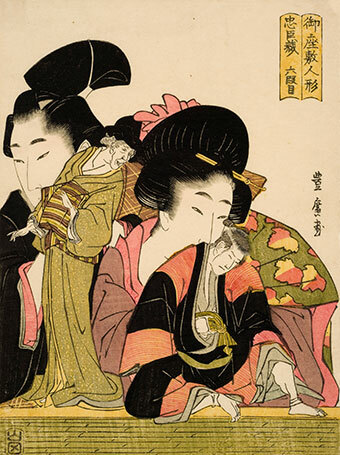 ADOPT A PRINT and support the exhibition and publication of The Artist’s Touch, The Craftsman’s Hand: Three Centuries of Japanese Prints from the Portland Art Museum.